This year marks the 70th Anniversary of Kenton Synagogue which has been hosting a wide range of celebratory events and Shabbatot in honour of this milestone. 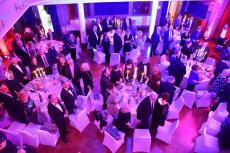 The year culminated in Kenton Synagogue’s 70th Anniversary Gala Dinner held on the last night of Chanukah. Tickets for the Gala Dinner were sold out upon release and the Shul had to set up a waiting list for those who were too late to buy tickets. It was a very glitzy evening with the Shul being transformed into a shimmering dinner venue. Guests were treated to an amazing four course meal supplied and served by M & M Events Ltd. Musical entertainment for the evening was provided by James Cowdrey and by Yair Schleider plus Kenton’s Gabriel Spiers who wrote and performed his own rap recounting the history and achievements of Kenton Synagogue. MC Marc Green made sure that the whole evening ran according to schedule. It was a truly wonderful evening and thanks must go to Irene Leeman, Chair of Kenton Synagogue, Joyce King and the whole Gala Dinner Committee who planned and ensured that Kenton’s simcha was truly unforgettable. View of the guests singing the Hatikva – photographer Sharna Kinsley.